Submitted by lynn on Friday, January 16, 2015 - 10:44pm. 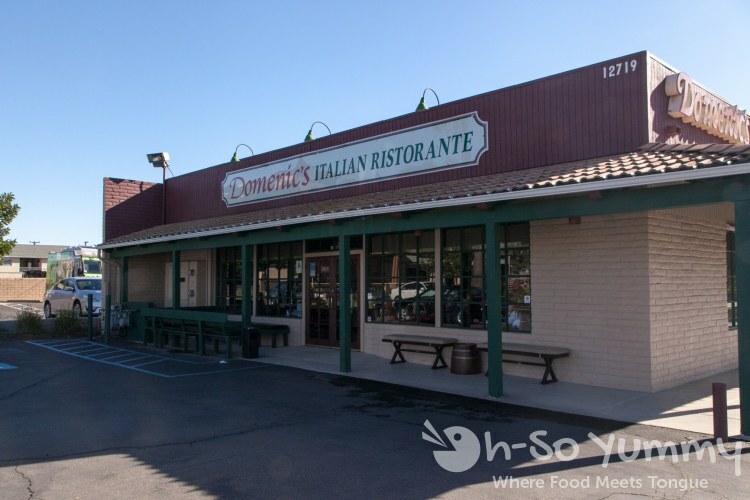 A new place we found through ibirthdayclub was Domenic's Italian Ristorante in Poway, which offered up to $10 off your entree, no other purchase required. Most lunch items were within that range so that meant a free lunch for me! Whoo hoo! To start, we were served a complimentary bread basket. 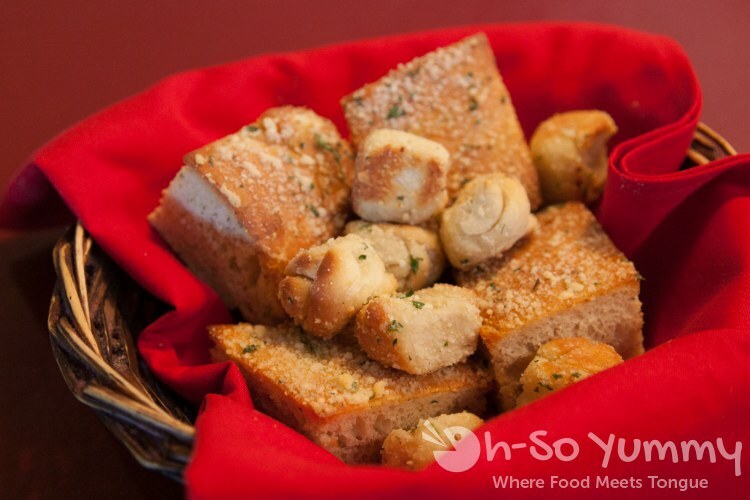 There were two types, garlic knots and focaccia bread. Dennis preferred the little knots because the were nice and fluffy and tasty. The focaccia worked fine dipped in olive oil and vinegar. I had the opposite opinion and liked the flavor of the big pieces. For some reason, all the parmesan made the bread knots taste drier to me. Our meals came with a choice of appetizer. 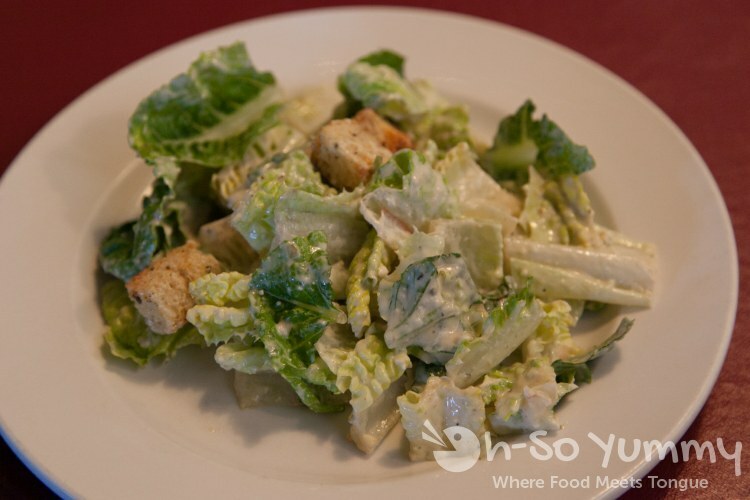 I picked the Ceasar Salad which had a bit of a mustard influence in the dressing which I wasn't a fan of (but I'm also not a mustard fan). 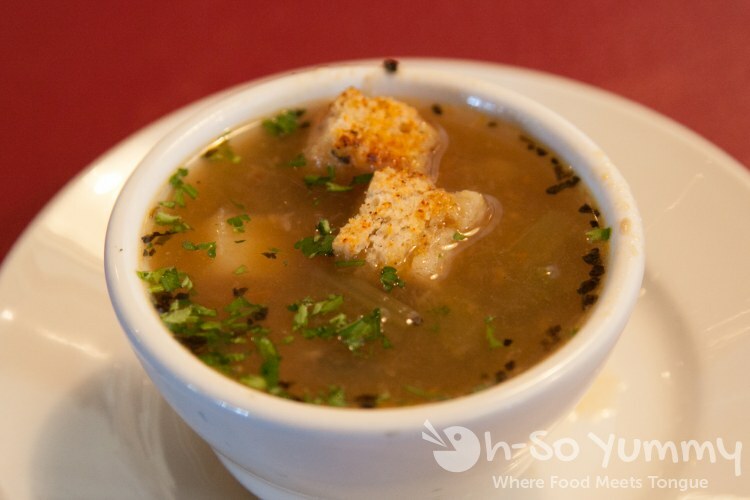 Dennis picked the Minestrone Soup appetizer and enjoyed the veggies and potato in the soup. Tis better than yours he said... haha, I guess he's not a fan of the beans that I usually put in my version! This was the Cannaloni (9.95). The first thing I asked was whether this had veal in it, since a coworker of mine said it's not authentic without it. Indeed, veal was one of the ingredients so I decided to give it a go. 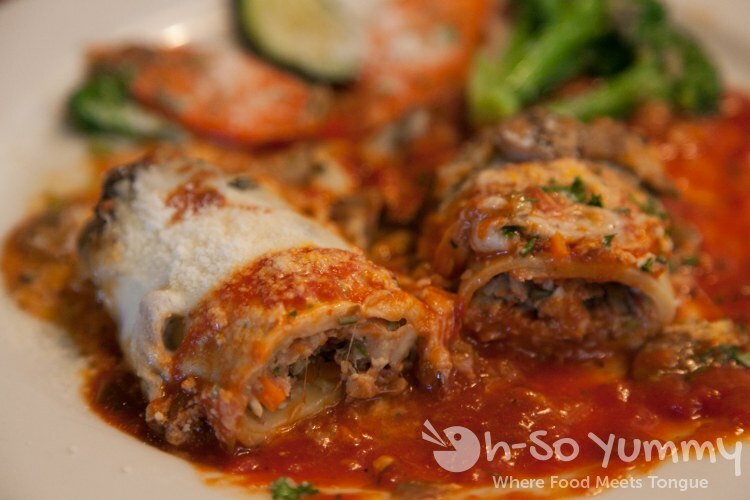 The insides of the cannaloni was a vegetable and veal mix with additional mushrooms on the outside. There was a mild meatiness along with the vegetables. The marinara sauce around it was scrumptious. Dennis let me pick the other dish too. 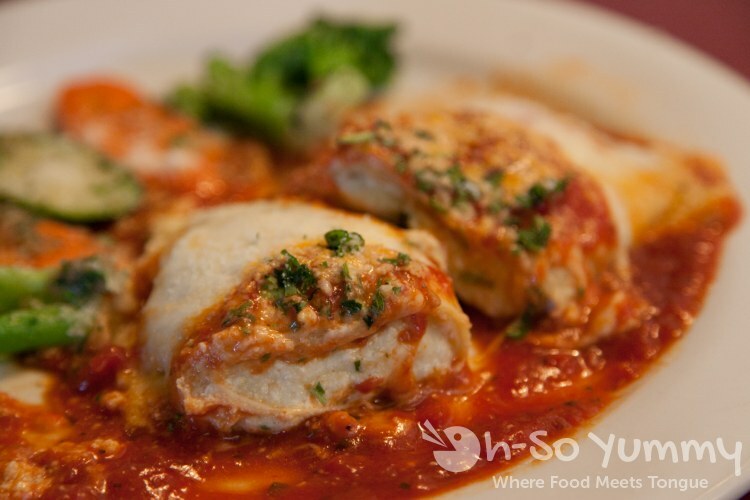 I decided on the Manicotti (9.95) which I had been craving ever since Joe's during The Wedge Escondido! 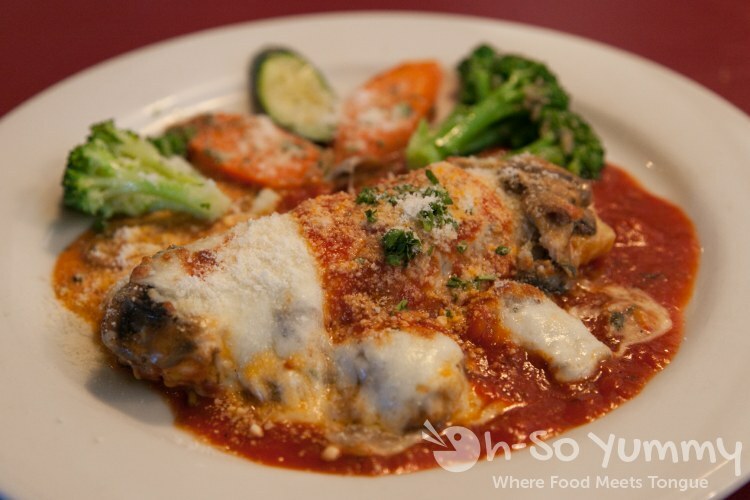 Of course, I didn't know that our two entrees would look so similar in the outer appearance, other than the mushrooms! I gotta brush up on my italian dishes! 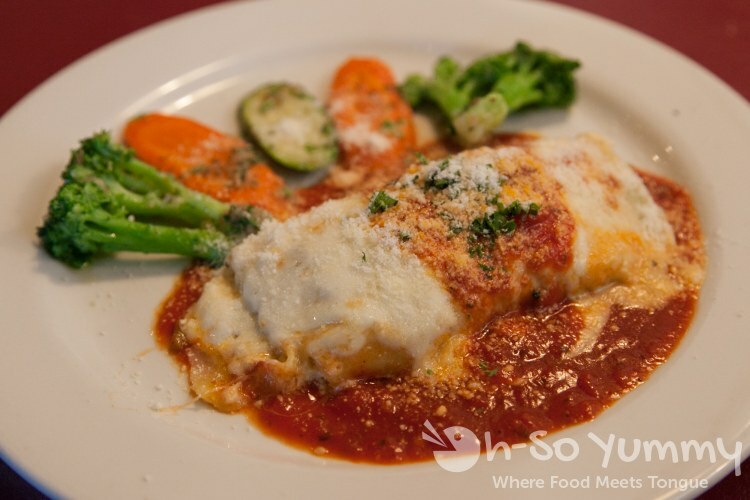 The manicotti filling was a multi cheese blend layered inside and Dennis enjoyed the rich cheesy flavors with the marinara sauce. He preferred this one while I preferred the other. The host guy came by once in a while and would joke around with us. He seemed pretty attentive and kept an eye on the customers. I also liked the chill instrumental Italian music in the background... felt a bit romantic and put me in a good mood. One thing we weren't able to try at Domenic's were the sandwiches. They have a dedicated lady who makes them and she was out sick that day. Another time perhaps? I've passed by this place a ton of times but I've never been in there. We honestly don't go to Poway much these days anyway but still a great deal! I might have to sign up for that one, too. Your two entrees do look very very similar. Maybe it's just a difference between the fillings? I'd be all about the cheesy one! We rarely go to Poway but turns out it's quite close after all! Plus coupons are mighty convincing! I really need some lessons on Italian food! The fillings are indeed what's different, in this case at least! Their weekend lunch is same price as weekday so I think we'll be back to try the sandwiches!